Price Waterhouse & Co. was an agent employed by the Custodian of Enemy Property (CEP), a branch of the Canadian government that oversaw the administration of assets belonging to internees and other enemy aliens. Internees were allowed to write three letters and four postcards per month. The maximum length for letters was twenty-four lines and eight lines for postcards. Exceptions were made for those who ran businesses and had to respond to letters from CEP. 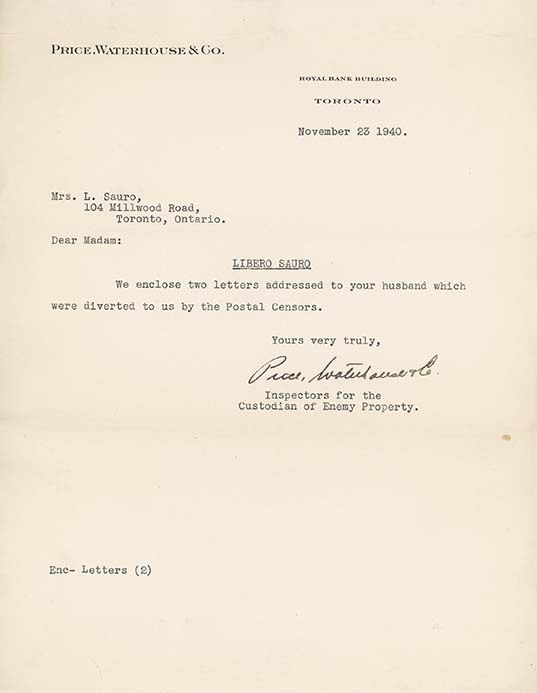 All camp letters were read by a censor. Contents deemed inappropriate were blacked out with ink. The same applied to incoming mail. Camp letters that were written in Italian were first translated into English before being read by a censor. It's unclear why the letters referenced in this email were not allowed through to Libero Sauro and instead sent to the CEP agent, Price Waterhouse & Co.